There is no doubt that it calls for quite a big investment when you decide to buy an embroidery machine. Hence from the technical aspects, you should also be sure that you get the best value for money when you buy these machines. You have to bear in mind that depending on the type and model you decide to choose, it could cost you almost the same money for which you could buy a used car. You should exercise care and caution. Small things like buying branded embroidery machines, having a fix on the purpose for which you will be using it could help a lot. In other words, if it is for commercial use then you may have to go in for heavy duty machines which could cost much more. Further when looking for embroidery machines it may not be feasible to look for something that has all the features and frills available. You should ensure that it helps in meeting the main needs for which it is being bought. The challenge is that there are scores of such machines available in the market. Hence choosing the right one often could be a challenging task. We will review five reputed and well known brands which will help readers to get a basic idea about various features to look for when buying an embroidery machine. Very versatile and unique. One can embroider, sew, quilt or do almost anything that one could think of under the sun. 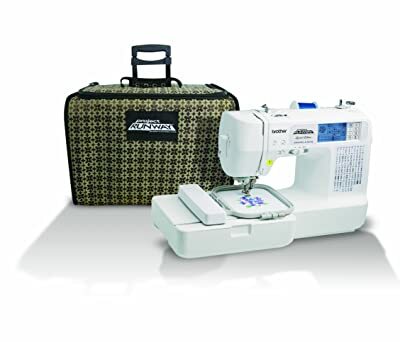 Has the widest variety of sewing functions, including 4 inch x 4 inch embroidery functions. All the 67 sewing stitches can be viewed at a time because of the high tech LCD display features. Can be connected to computer to import and use thousands of online and offline embroidery designs. Comes with a 25 year warranty and a bi-lingual user manual. Brings out the best and creative embroidery design choices. 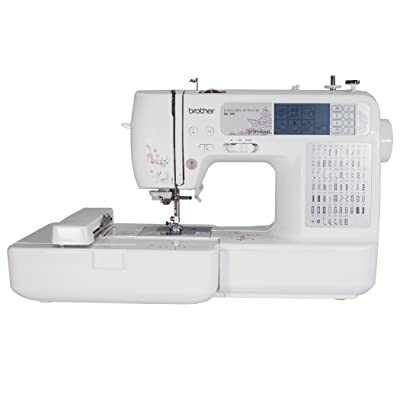 It has 70 designs which are inbuilt, and also some of the most complete sewing options. Suitable for 4 inch x 4 inch embroidery editing and designing. Can also offer 120 frame combinations and also accommodate 5 lettering fonts. Can be connected to computers for accessing thousands of designs. Easy to cut thread with automatic thread cutter option. Come with 25 year warranty. Comes with automatic needle thread and one of the easiest top drop-in systems as far as bobbin is concerned. Very easy to set up. It can be called as a holistic and complete embroidery and sewing machine offering 100 stitches that are built-in. Also comes with six totally automatic button holes with one-step feature. 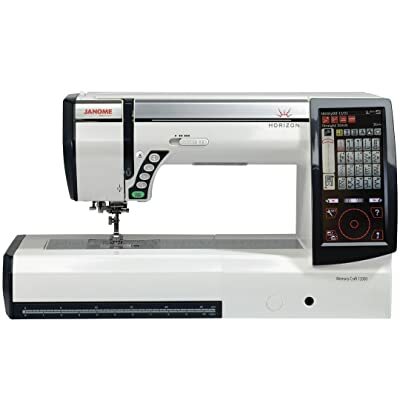 It also has a programmable needle function enabling the best of creative topstitching. It also has an AutoPunch Software. This helps easily convert images into embroidery designs. Can work on 110 AC voltage and suitable for use in USA and Canada. 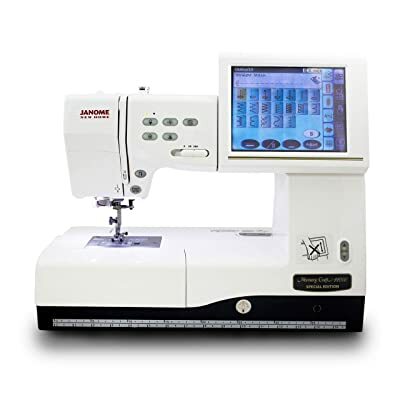 According to customers and critics, this particular brand comes with the most stable and largest embroidery system from the stables of Janome. It also features a 15 inch stainless steel plate which is located in the bed. Further it also comes with a bed that is situated 11 inches right of the needle. These features go in making it a machine which has the one of the widest workspaces. The touchsreen features allows easy creation and editing of designs. Also has a unique AcuFeed feature. Quilters like it for its power and precision. It is a very cozy and easy to handle machine without being saddled with embroidery attachments which are bulky. Comes with a set of easy to use tools, enabling the users to unleash their creativity to the best of their abilities. Famous for its compact footprint. Uses a robotic arm making the embroidery work that much more precise and accurate. The above five reviews might have helped customers to have some basic idea about the various important points to be borne in mind while evaluating and short listing embroidery machines. Additionally there are quite a few other factors all which must be taken into account when choosing a good and quality embroidery machines. The more the throat width, the better would be the ease of stitching. Throat width is nothing but the space between the needle and the body of the machine. Those who are looking for larger hoops and the best of quilting would do well to go for machines with throats which are generous. There are standards specifications as far as throat width is concerned. Following the internet and other sources of information could be useful. It always makes better sense to look for machines that are separated from the embroidery units. This will help not only in embroidery works but also for quilting. Further having them separately makes more economic sense. You can replace either one of them instead of spending money on the entire unit. To make the best use of the machine, it is important to ensure that it comes with the right accessories, fixtures and fittings. It should be able to connect directly to the computer so that the best of online designs can be imported and made use of. Put in perspective, if one spends time and chooses the right and best embroidery machines, it could go a long way in making it a wonderful equipment for your home. Consider all the above points before buying an Embroidery Machine. We have listed the best Embroidery Machines here based on the customer reviews. 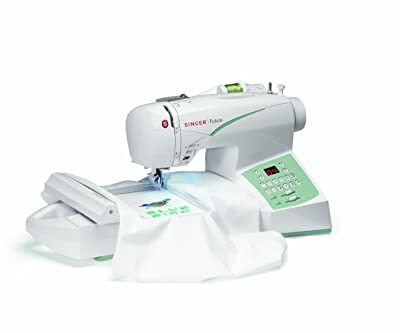 I liked the option of Janome Memory craft 11000se for the embroidery purpose.Generally embroidery machines have bulky attachments. this machine is really handleable and easy to use sort of.The main thing it has roboti arms for designing which makes patterns and looks perfect.